StoreYourBoard's Ski and Snowboard Storage Rack is the perfect rack to hold BOTH your skis and snowboards. 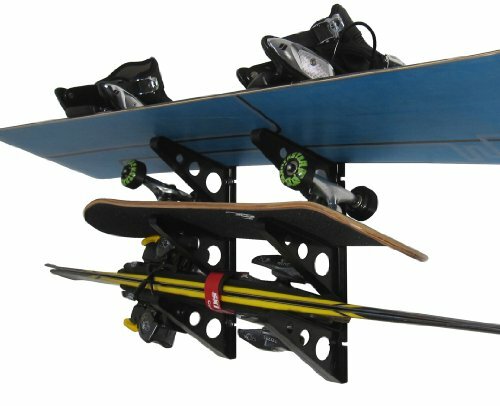 Store Multiple Boards: So many families and even individuals have both skis and snowboards--No longer do you need two separate racks to store them! Versatile Design: This Ski and Snowboard Rack is a simple, effective design to store, organize, and display all your skis and boards. The rack is very strong but also lightweight because it is made from ABS plastic. Rack is easily stackable to hold 6, 9,or 12 boards. Easy to Install: Comes with well written and diagramed instruction to make sure you mount the rack properly. Rack can be easily painted or spray painted to match room décor. Great for the garage, closet, hallway, mud room, child's room, or ANYWHERE! Will hold most boards under 12" wide. Many Uses - Skis, Snowboards, Skateboards, Scooter, Hockey Sticks, and more!